Fashion Truffles: Brown Or Black? That Is The Question. Brown Or Black? That Is The Question. I'm torn. I went shopping this past Saturday and found the most comfortable tall boots EVER. They're Cole Haan and have that Nike Air technology that makes the shoe fit like a glove... literally. 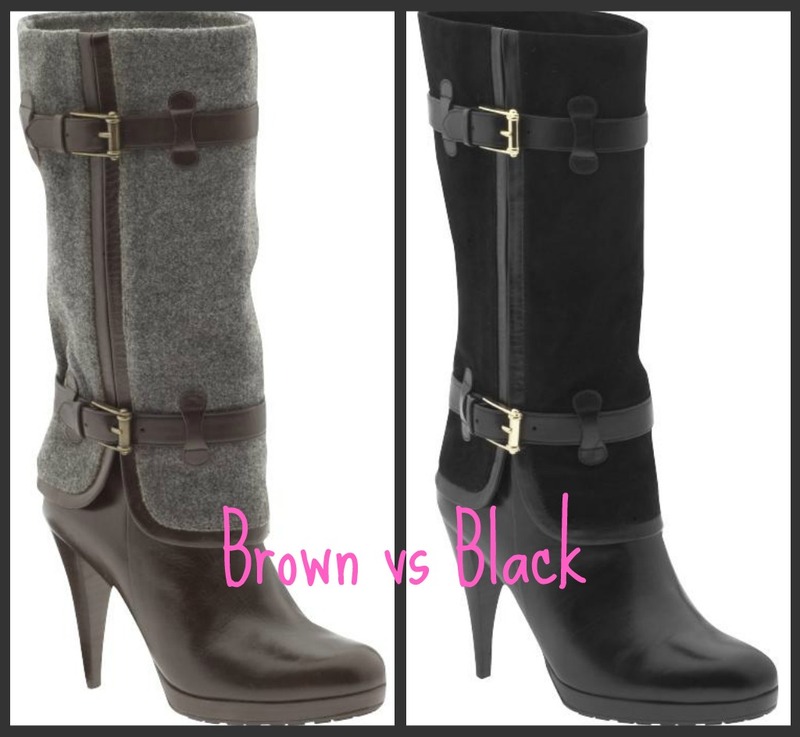 So these boots come in brown and black, but I can't decide which I like/need more. I would wear them a ton in either color - I really would. I like that wool detail on the brown style, but the suede makes the black one look more elegant for a night out in the town. Aaaaaah, decisions decisions! ﻿ What do you ladies think? I need HELP! My vote goes to the brown boots. You're right. There is something unique about the wool detail on the brown ones. LOVE them! I love the brown boots and perfect for fall. I hate when this happens.Would choose black,as you said they would look fab for a night out!! I absolutely love these! I actually really like both. Black if you are going to dress them up more, and brown if they're more for the day! Ah! Both are great. If you want to wear them out more for night I'd get black, but if you plan on pairing them more for day time I'd do the brown. So so cute! I usually don't like brown but I actually really like this one! Brown!